The Montessori concept of education was founded in 1907 by Dr. Maria Montessori. She was the first woman in Italy to become a physician. Her educational methods are based on a combination of her own research and scientific observation of children’s learning processes and work done by other scientists. Dr. Montessori designed a “prepared environment” that allows children to freely choose from several developmentally appropriate learning activities. This style of education is both a philosophy of child growth and a rationale for guiding this growth. Its basic concept is that children have developmental needs for both freedom within limits and a carefully prepared environment that will guide the exploration of learning materials and experiences that help to develop intelligence as well as physical and psychological abilities. It is designed to take full advantage of the self-motivation and unique ability of children to develop their own capabilities. Adults are important to expose the children to the possibilities of their lives, but the children themselves must direct their reactions to those possibilities. The transformation of children from birth to adulthood occurs through a series of developmental periods. The focus of Montessori education continually changes to meet the child’s changing needs and interests. The first plane of development is from birth to six years old. At this age, children are interested in the sensory aspect of their environments, languages, and cultures. The second plane of development is from six years old to twelve years old. This is when the children become more interested in the concepts behind their environments, languages, and cultures. There is a higher emphasis on abstract thinking and imagination. The third plane is from twelve years old and eighteen years old. This is when the children begin to search for their place in society and how they can contribute to it. The fourth plane is from eighteen years old to twenty-four years old and is when young adults get ready to take control of their own lives. The primary classroom consists of children aged 3, 4, and 5 years old. These children possess what Dr. Montessori called the “Absorbent Mind”. This means that children have the ability to absorb all aspects of the environment and culture without effort or fatigue. 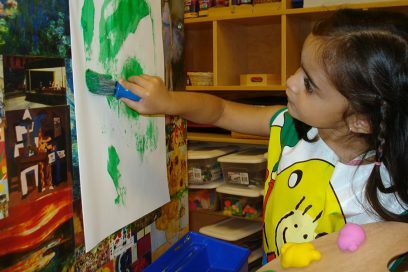 Individual work is encouraged at this stage because it helps develop the child’s self-construction. Children of these three ages are grouped together in one class because the younger children learn from the older children and the older have the opportunity to be a role model to the younger children. The teacher gives individual instruction of how to use all the Montessori material and once the child receives instructions he or she is free to practice with the materials as often as desired. It is this repeated practice that teaches the children and embeds the concept being taught into their minds. Because the children are free to choose their own activities, the teacher is able to observe each child’s individual development and decide when a child is ready to move on to the next lesson. Practical Life instills care for self, others, and the environment. Sensorial Materials are a tool for fully developing the senses. Cognitive skills are honed, and children learn to order and classify based on touch, sight, smell, taste, listening, and exploring the physical properties of the classroom. Language Development is critical to human development. A Montessori classroom provides the children opportunities to enrich their language skills with conversation, stories, and poetry. Phonics skills that are necessary to develop reading skills as well as the study of grammar are also a big part of the Montessori environment. Geography, Biology, Zoology, Botany, Art, and Music all have integral parts in the Montessori classroom. Mathematical activities give the children a basis for understanding the principles behind mathematical concepts. This prepares them for abstract reasoning and helps to develop problem-solving techniques. How is Montessori education different from traditional education? Dr. Montessori found that children learn best when all five senses are engaged, not only listening, watching, or reading. Therefore, the Montessori approach integrates all five senses into the curriculum. Children learn at their own individual pace according to their abilities. Montessori education takes a hands-on approach to learning. It uses a variety of activities to encourage children to develop observation skills as well as good learning habits. These activities use the five senses as well as kinetic movement, fine-tuning spatial skills, refining large and small motor skills, and understanding the concrete theory behind concepts like language and mathematics, which leads to understanding the abstract elements of the concepts. How do children from a Montessori program compare to children from a traditional education program? Research has shown that children from a Montessori program are well prepared for life academically, socially, and emotionally. Not only have they proven to score well on standardized tests, but they also are ranked above average on criteria such as following directions, high levels of creativity, completing work in a timely fashion, listening attentively, using basic skills, taking initiative, showing responsibility, asking stimulating questions, adapting to new situations, and showing enthusiasm for learning. How are children disciplined in a Montessori environment? When a visitor observes a Montessori classroom one of the first elements noticed is how well behaved and peaceful the classroom is. Montessori programs implement self-discipline and the children know from the beginning what behavior is expected of them. There is no manipulation or coercion and the children don’t look at the teacher as being mean or strict. The children realize that their basic needs are met and the teacher is there to help them. The key to making this type of environment work is to have a properly prepared environment that will meet the needs of the children and a teacher that is trained in positive constructive ways to guide the children. Why should parents consider Montessori education for their children? The first plane of development (from birth to six years old) is such a critical time for developing and nurturing a love for learning. The education received during this time lays the groundwork for all other learning that takes place throughout the life of the child. The Montessori approach gives children confidence in these early years that is evident years later. Not only is the groundwork for learning being laid down during this time, but the child’s personality, outlook on life, and intelligence potential are also being formed. For a child to truly reach his potential it is vital to provide him with the tools and resources necessary for development and learning to occur. A sufficient understanding of how a child’s mind works and develops is crucial to this development. Montessori teachers are given these tools as a part of their training.